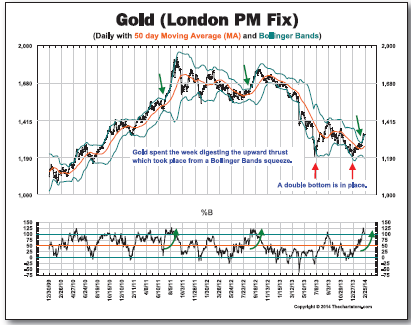 As the fundamentals have improved, so has the technical picture for gold. There’s more here than the simple turning of the calendar. 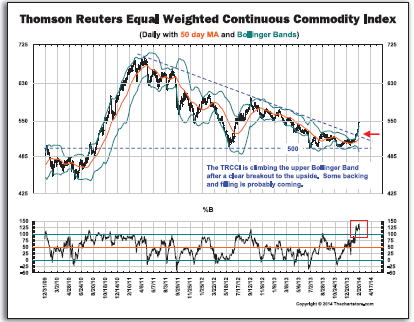 As I had predicted late last year, just the very fact that a new year had begun would be bullish for gold. After the carnage we had endured in 2013, the simple psychological benefit of putting that experience behind us would help in some way. So as traders returned to their desks in the New Year, this selling pressure had been relieved. And, while Western investment demand didn’t exactly bounce back immediately, buying from Asia continued to support the market. 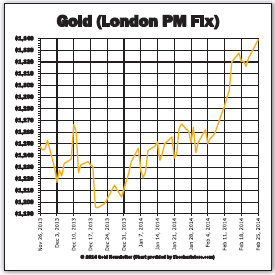 Thus, gold rebounded — in fits and starts through most of January, but at a very steady rate over the last month. Granted, it’s been a slow climb, with few trading sessions showing big gains. But there also have been relatively few losing days. Rather than the two-steps-forward, one-step-back pattern that we had been used to (or even the one-step-forward, two-steps-back that we saw last spring), gold at this writing has posted only six down days out of the last 24 trading sessions. Not a bad batting average at all. So, again, there has to be more here than the mere turning of a new year. And there is. In particular, two primary factors are driving gold right now. So let’s take a look at both. The huge flows of gold from Western speculators to Eastern savers, also known as the battle of “paper gold” versus “real gold,” is old news to you by now. I’ve been reporting on this development for nearly a year now, ever since the orchestrated gold smack-down of last April ignited a firestorm of bargain hunting gold buying from Asia. But that surge in Asian demand, which at first seemed to be a temporary reaction to the sharp drop in the gold price, has since proven to be a long-term, secular trend. 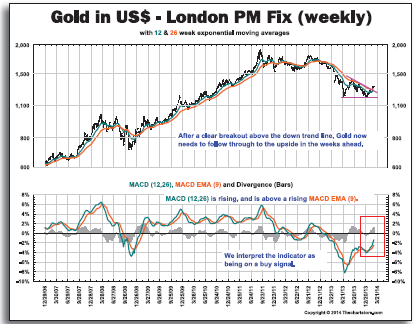 The evidence for this has come from the steady declines in COMEX gold holding, in anecdotal reports from Swiss refineries (some of which were reportedly doubling capacity and running 24-7 to melt down central bank gold bars for export to Hong Kong), and in delivery reports from the Shanghai Gold Exchange. As I say, much of this information was anecdotal. But in recent days we’re starting to get some interesting (and sometimes conflicting) metrics on just how massive this demand has been. 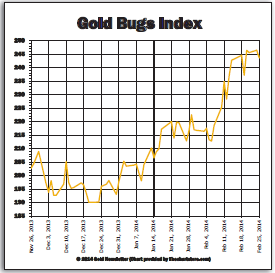 For example, Reuters recently reported on some official import/export data for gold passing through Switzerland. Customs data show that exports of gold from Switzerland leaped 77% last year, to 2,777.14 tonnes. Imports of gold into Switzerland leaped by over 33% to 3,060.66 tonnes. Fully 60% of the gold imported into Switzerland originated in the United Kingdom, which makes sense as the London Bullion Market Association (LBMA) is the world’s largest center for gold vaulting and exchange. Monthly customs reports show that in January, 44.3% of Swiss gold exports, or $3.5 billion in value, was shipped into Hong Kong. In fact, the top five recipients of Swiss gold were in Asia, with India, Singapore, the United Arab Emirates and China joining Hong Kong on the leader board. As you’ll remember, Switzerland is a major nexus for gold traveling from the West to the East, because Asian consumers prefer specific bars and weights that aren’t commonly used in the U.S. and Europe. So the bullion coming into Swiss refineries is melted into the forms desired in the Asian markets. And, again, we’ve received reports that much of the gold bars going into the Swiss refineries has central bank markings. Also, bars are increasingly showing decade sold date stamps that may indicate the bottoms of vaults are being reached. Back to the metrics compare this amount of gold shipped to Asia just from Switzerland last year (2,777 tonnes) to the amount of gold sold from exchange-traded funds in 2013 (881 tonnes), and you see that Asia is absorbing all the gold being sold by Western speculators, and then some. Now let’s look at some estimates of Chinese demand where, recently, we saw figures come from two industry sources, and conflicting numbers from some respected analysts. The most widely reported industry estimates came from the World Gold Council, which ascribed 1,065.8 tonnes of gold demand for China in 2013. At this level, it beat India for the first time, to become the world’s largest and most important gold demand sink. The WGC estimate looks fairly accurate when you compare it against the report of the China Gold Association, which estimated Chinese gold demand of 1,176 tonnes last year. Of course, the SGE is not the only source of gold in China. And while Hong Kong is also an important port of entry for gold, much of the gold coming into Hong Kong is also exported. So it can get very confusing, and there’s really no way to come up with an accurate number. But the best work I’ve seen on this was recently done by GoldMoney.com analyst Alasdair Macleod, who netted Hong Kong imports/exports to/from China from the SGE deliveries, and also netted out gold re-exports from Hong Kong. I think Macleod has come up with the most accurate estimation of Chinese gold demand around, and his number is astounding. He shows Chinese demand of 2,668 tonnes for 2013. And believe it or not, this figure is conservative. It does not include gold imported directly through mainland China and not sold through the Shanghai Gold Exchange and does not include imports of gold coins through Hong Kong (another 48.5 tonnes). Thus, total Chinese gold demand could be more than double the estimates of the Chinese Gold Association and the World Gold Council. And, very importantly, this level of demand has not fallen off. Latest reports show that, despite China’s absence from the market during the New Year holiday from the end of January to February 10, gold demand remains at or near record levels. For years, I’ve reported that Asian gold demand represented the support beneath the rising gold price. 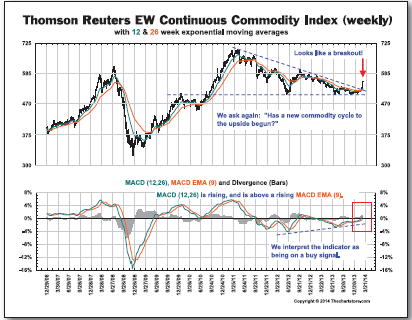 Demand from Western buyers was driving the price higher, and every correction in the price trend would bring in Asian bargain hunters to cushion and halt the decline. Asian demand. Not just bargain hunting, but a major surge in everyday buying that refused to wane. From 2000 to 2008, the major rallies in gold occurred whenever, for whatever reason, the Western and Eastern markets were both buying. We haven’t seen this phenomenon since the rebound from the credit crisis of 2008. Now we may be seeing it again.